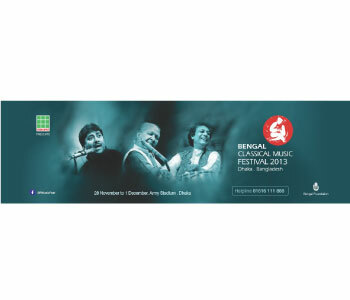 Bengal Classical Music Festival 2013 was dedicated to Gyantapas Professor Abdur Razzaq. The world’s largest classical music festival in terms of number of performers on a single stage, audience capacity and duration, was held this year bigger and better! This time around, the Festival will went on all night for 4 consecutive nights. The list of performers included names like Shiv Kumar Sharma, Hariprasad Chaurasia, Bahauddin Dagar, Bombay Jayashri, Ajoy Chakrabarty, Rais Khan, Rashid Khan, Swapan Chaudhuri, Kaushiki Chakrabarty amongst mImage TitleThe event was held from November 28 to December 1, 2013.